You’ve probably already researched some of the more popular activities to do in Baños, like the waterfall route by bike, the thermal baths, outdoor adventure activities and the Casa del Arbol (the swing at the “edge of the world”). The reality is, Baños is a spectacular destination that has more to offer than can fit in one blog, and we’ve put the following together to provide you with even more options during your visit. Luna Runtun (Luna Volcan) is one of Ecuador’s top hotel spas and is definitely worth visiting while you’re in or around Baños. Even if you can’t afford the $250/night room, you can enjoy the one-of-a-kind Runtun thermal baths for $20 and grab a bite to eat afterwards. Nestled along the lush mountainside of Volcano Tungurahua, Luna Runtun is only a 20 minute drive from Baños. Once there, you’ll be rewarded with stunning views of the city of Baños, the volcano and the adjacent Llanganates National Park. Luna Runtun offers overnight visitors inclusive packages (incl. breakfast and dinner) in cozy hotel rooms or suites with access to a first-class spa and an excellent menu of local dishes at the various eateries. The hotel is advertised as a “romantic hotel” for good reason (think wine and candlelit dinners), and most of its rooms are furnished with a chimney for even more coziness. However, Luna Runtun is an excellent option for families and also solo travelers who want to experience some true relaxation while surrounded by nature and with easy access to numerous outdoor adventure activities. At Luna Runtun, you can basically do all the activities advertised around Baños, such as hiking (there are 11 hiking paths around the hotel), rafting, cycling, and horseback riding. Conveniently, from Luna Runtun, you can organize outings farther into the Amazon and even to the Galapagos Islands. Samari Spa was built from a renovated 300 year-old monastery and appeals to the more sophisticated travelers that appreciate its tranquil environment, gorgeous gardens, gourmet meals and luxury service. Located closer to Baños, only 1 mile from the city center, Samari Spa competes with Luna Runtun in terms of price and value, but doesn’t associate its brand as much with the Baños outdoor adventure vibe. Visiting Samari Spa is like taking a journey to a fairy-tale estate, surrounded by lush, green mountains. You won’t regret splurging a bit for this serene experience. While Baños is must-see destination during your trip to Ecuador, we’re not going to lie, it can start to feel awfully touristy after a couple of days. For those of you that want to see less touristed town nearby, here are a few you might want to consider. Located about 25 minutes from Baños (towards the Andes on the road to Ambato), a visit to Pelileo makes for a wonderful day trip. Here, you’ll experience everyday Ecuadorian culture, as well as a glimpse into the indigenous Salasaka culture. Do you need a pair of jeans? Interestingly, and somewhat randomly, Pelileo is the largest producer of blue jeans in Ecuador and is known for its market days (Saturday and Tuesday) on the Artesanal Plaza Kayak Raymi where locals buy pants, hats, and furniture. Outdoor adventure activities available from Pelileo include paragliding, rafting, cycling (including a night ride), and hiking on the Cerro Teligote. Find contact details for many of these activities on the official Pelileo town website or just go there early in the morning and ask around. 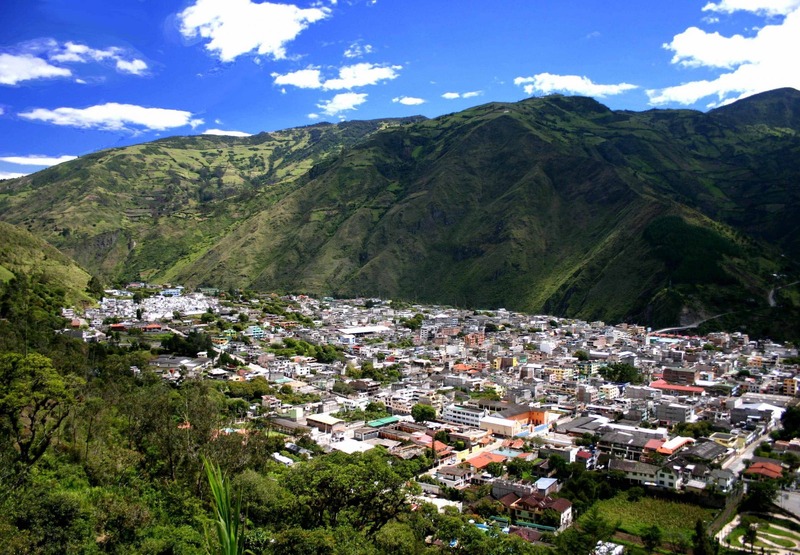 After Baños, Pelileo will feel like a much quieter, simpler and more cultural place to visit. Perhaps this is just what you were looking for! Hacienda Manteles is located on the north side of the Pastaza River, adjoining the fabled Llanganates National Park (fabled because the treasure trove of the last Inca Emperor, Atahualpa, is said to be buried somewhere in its wild mountains). The view from this side of the mountain, across the Pastaza to the hulking (and sometimes huffing and puffing) Tungurahua Volcano, is stunning. To get there, take a taxi from Baños on the Ambato road and turn north to cross the Pastaza. The road winds through acres of fertile fields, usually overflowing with all sorts of crops and fruit trees (look out for tree tomato, mandarines, oranges, apples…). The family that own the hacienda have bought up hundreds of hectares of land around it over the decades and protected them from deforestation. There are lots of lovely trails to wander and hike. To stay at the hacienda costs around $120 per night, but you can also call in advance to make a lunchtime reservation. Rio Verde is yet another town near to Baños that you won’t find on Trip Advisor. 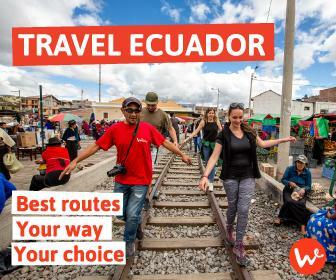 However, you might’ve already stopped through Rio Verde without even noticing on your way to the Pailón del Diablo and along the waterfall route from Baños. To accommodate the constant flow of tourists from Baños, a few hostels and restaurants have popped up in and around Rio Verde, which is truly a teeny town in comparison to Baños. Its size makes it an ideal option for those that want a more local experience away from the hubbub of the nearby city. Apart from visiting the Pailón del DIablo, while in Río Verde you can also visit the orchid garden, butterfly garden, and grab a bite to eat at the Las Hortencias Restaurant at the entrance of the Pailón del Diablo. Alternatively, if you’re interested in spending the night in Rio Verde, you can check out the Miramelindo hostel and spa (starting at $100/night). Some of the cheaper hostels around Rio Verde don’t appear on Google Maps but can be explored once there, and there are also a few camping options for those of you on a tighter budget. Most travelers that come to Ecuador for a jungle experience want to go wildlife spotting and birdwatching and often forego a visit to the surrounding cities. However, if you have a few days to spare, we strongly encourage you to explore some of the towns located between Baños and the Amazon. Rather than opting for a pre-packaged rainforest tour, you might try visiting Mera or Puyo, eating local delicacies and exploring secret waterfalls with indigenous community members. Located an hour from Baños, Mera is one of the smallest towns in the Pastaza province and is home to less than 1000 inhabitants. While there aren’t nearly as many places to stay here compared to Baños, it’s an area with many beautiful hidden waterfalls and trails to explore. On the way to Mera, in a town called Cumandá, you’ll find an excellent restaurant: the Swiss Bistro Cumandá. This is the same Swiss Bistro‘ you might’ve seen in Baños and offers the same menu, but in a very different setting. A true jumping off point for travelers heading into the Amazon, Puyo is a medium-sized city that offers travelers many hostel and food options. Here, you’ll get a real taste of local food and culture while still easily accessing the Amazon rainforest. In terms of meals, Puyo is a great place to try some traditional Ecuadorian food of this region, such as chontacuro (grilled larvae), maito (freshwater fish steamed in banana leaves), armadillo stew, chicha (local fermented alcoholic beverage), and fried yuca. An excellent, very local and well-priced spot to try all of these local delicacies is at Wijao, a restaurant close to Puyo’s bus terminal. Closer to the town center you’ll also find a number of restaurants serving cheap, local lunches of maito and yuca. In terms of activities, day-trip tours can be organized from Puyo itself and many of these include visits to nearby (45 minute drive) indigenous communities. 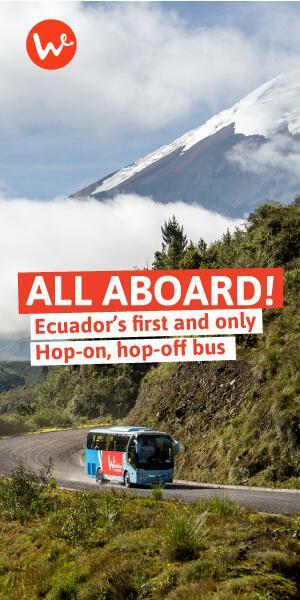 If you’re short on time, it’s completely understandable that you only stop through Baños. It’s an exceptional destination and offers visitors many hostel, restaurant and adventure sport activity options. However, if you have a few days to spare and want to experience a less touristy side of life in the Tungurahua and Pastaza provinces, you won’t be disappointed. The grilled beetle larvae alone will be worth it!